Little is known for certain about the cluster of early redwood buildings at the corner of Main and Carlo Streets. 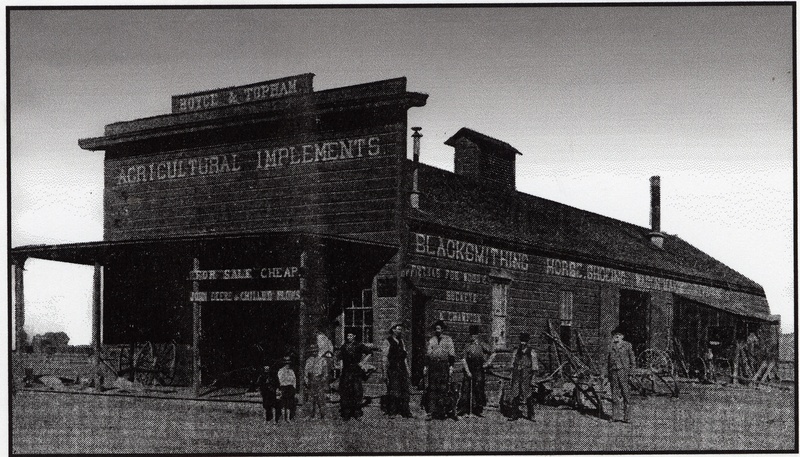 The location is where Michael Hughes built the first wood frame house in Milpitas. He constructed sheds, barn and various farming out buildings. To the south he had a small fenced pasture where he ran a dairy. According to the city’s historic sites inventory, at least one house on the site is believed originally to have been built by A. Rose. According to one long time resident, this was either Alfred or Amaro Rose who were from the Azores but not related to the Rose family for whom Rose Peak, the mountain to the east and north of Milpitas is named. A hand drawn map of the Main Street of the 1930s, believed to have been made by Ray Madruga in the late 1970s, identifies the property as being the residence of the Valencia family. Originally there was not a street where Carlo Street is today. There was a Ford Motor dealership and a service station owned by Frank Krusich right where the middle of Carlo Street is. The original street that ran nearby was an extension of the present day Spence Street, a residential street in the Milpitas Manor neighborhood, which cannot be seen from the modern intersection. Today, Spence Street ends about 150 yards to the west of Main Street. The spot where the old street intersected Main Street is due west of the historic Spangler Brothers' Service Station (the independent gas station on the corner of Main and Carlo Streets). To the north, on the corner of old Spence Street and Main Street was the first residence of Sal Cracolice. The pioneering pharmacist in Milpitas, who for many years was known as "Mr. Milpitas", Cracolice walked to his business which was in the large two story building, then called Maple Hall, near the intersection of Main and Serra Streets. Today the Calaveras Blvd. overpass covers the site of the Cracolice home. Dr. Cracolice’s neighbors to the north were the Ray Madruga family. Madruga owned a blacksmithy and metal shop called the Madruga Iron Works located on the east side of Main Street about 200 feet south of the Main and Carlo interection where there is presently a Buddhist convent. Today one sits in the Madruga's front yard while waiting for a County Transit bus under the overpass! Madruga's Iron Works (his blacksmith shop) is believed to have been built by David Boyce and Edward Topham in the 1870s. Here they invented the famous Milpitas Plow. Present on the site in 1997 were a tall pump/tank house (the last privately owned one in the city), a small main house, a one car garage/storeroom, and other small outbuildings. At that time, it was one of fewer than a dozen original homes which still stood along Main Street but was the only one believed to be in its original condition and with its original associated structures. In 2000, the owner tore down all of the buildings to make the property more appealing for sale to developers. Today, the site is vacant and awaiting commercial development.